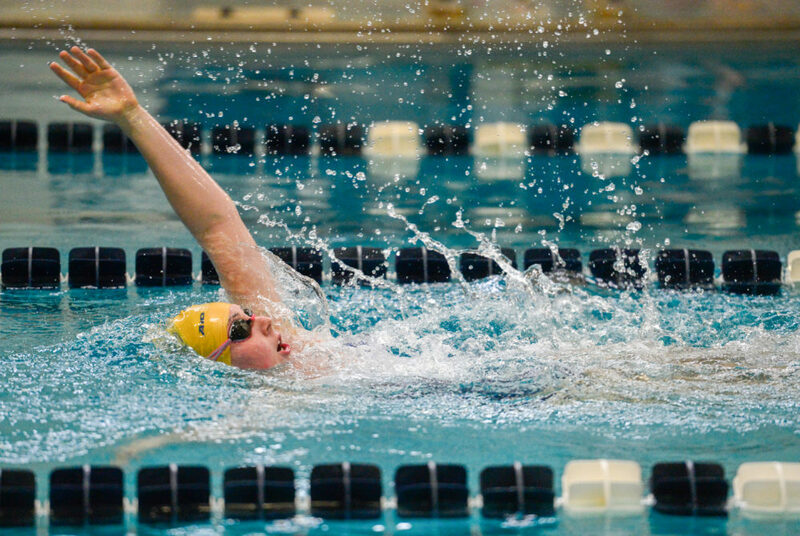 Sophomore Elizabeth Vogel races during swimming and diving's first dual meet of the year at Howard Saturday. Men’s and women’s swimming and diving won 16 of the 24 events at Howard Saturday during the first full-team meet of the year. The Colonials defeated the Bison 136–85 on the men’s side and 127–80 on the women’s. Chowan also competed against the women’s side and lost to GW by the largest margin of the afternoon, 134–66. The victories were not unexpected, as Howard fell victim to both Colonials teams last season and GW’s men’s team is coming off an Atlantic 10 championship. But head coach James Winchester said he was happy about the work that his team put in during the meet nonetheless. The win comes after the Colonials started the season in unusual fashion, racing in an open-water meet in September and a small event in Miami last week. Senior Clarke Indek said the meet against Howard allowed GW to ease into the season better and get freshmen more involved in competitive races. He said it was good for them to experience a college dual meet where there is not any warm up or cool down like they likely had in high school. Nine freshmen competed for the Colonials on the day, including Youssef Ragab in the 200-yard freestyle and Andrea Ho in the 200-yard individual medley and 500-yard freestyle — both of whom came away with individual first-place finishes. Including relays, 11 of GW’s event wins involved underclassmen. “You could tell a little bit that some of them were nervous about competing in their first college meet,” junior Miranda Simon said. Since many of the freshmen competed in their first collegiate race Saturday, junior Jake Ortiz said they try to stay comfortable and loose, which is easier when they are less than three miles away from Foggy Bottom. The divers also used the early-season competition to hone their techniques. Two Colonials divers finished ahead of the highest-scoring competitor on the men’s side, but Howard picked up the one-meter dive for its women’s team. Ortiz – who set program records at each of the diving heights last year – finished the meet with a first-place score of 302.65 on the one-meter board. In the pool, sophomore Max Forstenhaeusler and junior Tommi Wolst each took home two individual events for the men’s team, while sophomore Jackie Torrez and juniors Caroline Racke and Isobel Walker played a role in two event wins on the women’s side. Winchester said the team was encouraged but not satisfied from the victory. The men’s swimmers said they expect a second conference championship, while Simon said the women’s side is aiming for third place. The Colonials return to action next week, hosting their first home meet at the Smith Center Saturday at 2:30 p.m. against Boston College. Indek – who competed in two races Saturday – is hoping that during GW’s home opener, the Colonials can provide enough energy to propel them to victory, he said.